The grandmasters of data, Glo, is at it again with its latest tariff plan called jollific8 which gives new subscribers 8 times bonus on all recharges. 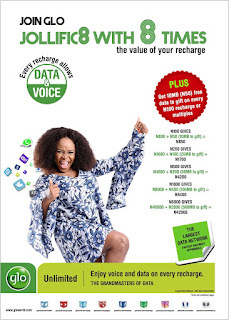 This means an 800% bonus on all recharges and it comprises data and voice. Today i will be dissecting the Glo jollific8, giving you 10 facts about this plan to help you decide joining it or not. 2. You Cannot transfer the Jollific8 benefits to another glo line however only the Gift Data can be transferred to another Glo line or Sim. 4. All bonus not used before the expiry date will be removed. 5. When charging, bonus accounts are charged first until it has been used up or expired, then the Main account will be charged. Since, N100 gives N800 . With 67k/s (N40.2 per min), N800 gives 20mins talktime. Its clear glo jollifice8 gives 800% bonus nd charges N40.2kobo per minute, that's giving something with one hand and collecting it with the other hand. But N100 for 20mins plus extra data is not that bad. I say its not bad because if they decided to charge N5 per min with no extra bonus, N100 gives the same 20min talktime. So don't get blown away with the 800% bonus, what matters is not the percentage of bonus our service providers are offering but the amount they charge per second. 7. The jollific8 benefits can be enjoyed for as long as you remain on the plan. 8. You can migrate out of glo Jollific8 by dialing the migration code of your new desired plan. 9. Migrating out of Jollific8, terminates the 800% bonus offer. 10. Glo jollifice8 is a one time migration offer so you cannot migrate back to Jollific8 tariff plan after you've migrated out of the plan. • Buy and register a new Glo Sim. That's all, tell us what you think about this plan, using the comment box. Download Nairabit android app to get instant updates from us.